Welcome to another week full of fresh ideas and innovation at el producto. $15B - SoftBank plans to add to its $100B Vision Fund; the fund has invested ~$70B since its launch in 2017; plans to launch a second Vision Fund as well. $500M to $1B - plans to raise China-based bike-sharing firm Hellobike; the company claims 200M registered users; raised $1.8B to date. $12M - raised by customer experience platform Squelch in Series A (extension); SaaS suite integrates with Salesforce, Zendesk, Slack, etc to index data for personalized and simplified interactions; raised $20M to date. ~3.2k - satellites Amazon plans to launch to address underserved broadband areas around the world. Amazon has filed with the International Telecommunications Union to operate a constellation of broadband satellites in low-earth orbit. 200k - signups in the first 48 hours of availability of Apple News+, the company’s $10-per-month news and magazine subscription service. 58.4% - of all vehicles sold in Norway in March were electric, a global record; EVs represented 31.2% of Norway’s 2018 auto sales. ~20% -jump experienced by Bitcoin on Wednesday, breaking $5k for the first time since November; represents the cryptocurrency’s most significant single-day gain in almost a year; analysts attribute the increase to a ~$100M order spread across multiple exchanges. 15% - Samsung predicts Q1 revenue of ~$45B to $46B, down 15% YoY; profits expected to fall to $5.5B, down 60% YoY, which represents the largest drop since Q3 2014; Samsung will release its full Q1 report later this month. Amazon plans to launch Alexa-enabled wireless earbuds as soon as the second half of this year. Amazon announces Alexa skills for healthcare; the six voice-controlled apps available at launch include Atrium’s scheduling app and Livongo’s blood sugar data app. 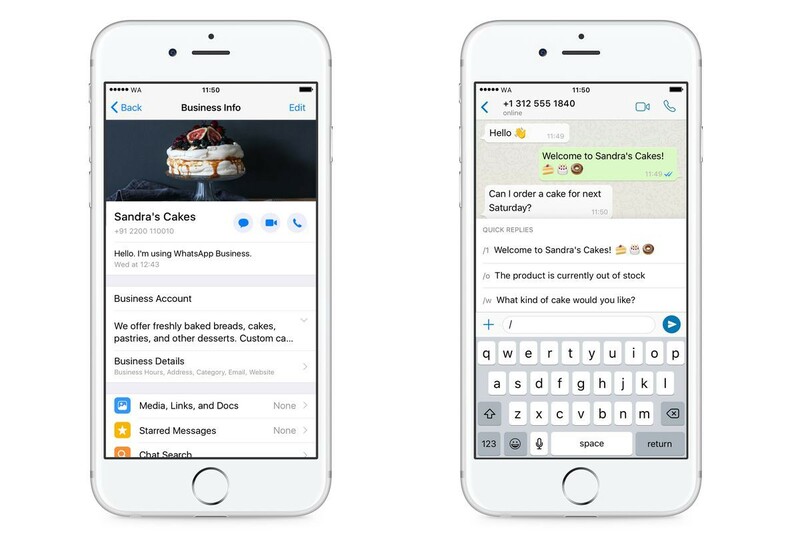 Facebook rolls out WhatsApp Business for iOS worldwide (previously available for Android); lets SMEs connect with customers via the messaging app; businesses can also display an email address, store details, and more. WhatsApp launches a message verification line for users in India; users who have received a message they’re unsure or suspicious off can pass it along to a dedicated WhatsApp number; they will then receive an update on the veracity of the message’s claims; the line is operated by research firm Proto. Facebook adds a Newsfeed context tool to help users understand why they’re seeing specific posts; similar to “Why am I seeing this ad?,” the feature has a dropdown menu with more info about Facebook’s targeting; includes links to personalization settings. Mark Zuckerberg calls for a “more active role for governments and regulators” regarding the Internet; in an opinion piece published in the Washington Post, the Facebook founder advocates for new regulations covering harmful content, election integrity, privacy, and data portability. Zuckerberg also indicates Facebook may introduce a dedicated news tab featuring content from paid publishers; the comments come in an interview with Axel Springer CEO Mathias Döpfner where he suggests 10-20% of users want more news than is available in News Feed. Facebook explores restrictions for live video; Sheryl Sandberg says it’s one of the steps following the Christchurch attacks; restrictions could consider factors including prior Community Standard violations. Beats announces $250 Powerbeats Pro; the wireless earbuds feature the same Apple H1 chip as second gen AirPods; includes hands-free Siri and come with a charging case; promise nine hours battery. AI research scientist Ian Goodfellow joins Apple from Google; Goodfellow now serves as director of machine learning within Apple’s special projects group; Goodfellow is known for his work on GAN systems. YouTube execs have known its algorithms recommend more and more extreme content for some time; staff have raised concerns in the past, but the company has made viewer engagement its primary focus; YouTube says it conducts millions of viewer surveys each week to ensure it’s recommending satisfactory videos. Google is rolling out Duplex, a Google Assistant feature that makes restaurant reservations on the user’s behalf, to iOS and Android 5-plus devices; previously limited to Pixel devices. Gmail’s Smart Compose tool adds subject suggestions; the AI-powered tool scans the body of an email and then proposes a possible subject line; rolling out now for desktop web. Google rolls out the second Android Q beta; features new multitasking tools, a foldable device emulator, mic pickup API, and more; includes Bubbles which lets users place app functions such as chat messages over other apps. Google begins shutting down Google+ accounts and deleting user data; the company accelerated its sunset schedule after an API bug exposed data belonging to 52.5M users. Google shuts down its AI ethics board; launched last month, the advisory council was set to meet four times a year to discuss Google’s AI projects. India-based hotel platform Oyo raises an undisclosed investment from Airbnb; reports suggest the deal could be worth $100M to $200M; as part of the arrangement, Airbnb will look at the possibility of listing Oyo accommodation on its platform. Microsoft will merge its Kaizala group messaging service with Teams; initially launched as a productivity app aimed at the Indian market, Kaizala has since expanded to more than 180 countries. Microsoft partners with BMW to launch Open Manufacturing Platform; the scheme aims to establish collaborative IoT standards for manufacturing. BlaBlaCar CEO and Co-Founder, Nicolas Brusson, shares an interesting note on their evolution and growth as a traditional shared mobility platform into an intermodal one. Slack plans to go public via direct listing on the NYSE in June or July; the company was privately valued at $7.1B for a $427M Series H in August 2018. Snapchat launches Scan, a platform for AR features; launch partners include Photomath, which solves math problems based on the live image, and Giphy, whose implementation finds GIFs relevant to the camera view. Snap announces App Stories, a Snap Kit feature that enables third-party developers to display Snapchat Stories in their apps; Tinder and Houseparty will launch integrations; Snap also announced the Snap Audience Network, which will extend Snap’s advertising platform to third-party apps. Snapchat launches Games platform, offering real-time multiplayer titles; features five games at launch from developers including Zynga and ZeptoLab. WordPress updates its iOS app to address a flaw that exposed account tokens to third-party sites; the tokens enable users to remain logged in; the company disconnected affected accounts. Internet Archive uploads 450k songs collected from MySpace; referred to as the MySpace Music Dragon Hoard, the tracks were uploaded between 2008 and 2010 and were gathered before MySpace inadvertently deleted years of content. Nintendo says it will release free VR updates for Switch games “Super Mario Odyssey” and “Legend of Zelda” on April 25; the VR modes will offer some immersive features rather than full virtual experiences throughout; requires VR Labo, which launches April 12. Chinese drone company EHang and Austrian aerospace company FACC demonstrate autonomous flying taxi in Vienna; the pair have partnered to develop a service offering short-haul transport for medical supplies, industrial equipment, and passengers. Deep learning has found two exoplanets that human astronomers missed. Two new Super-Earths were uncovered by a neural network at University of Texas. Personas at Spotify. The guys at Spotify share some useful insights on the process they followed to create personas and how they are using them today. Complement this read with InVision’s Persona Template. What do companies successful in design have in common? Leah Buley, Director of Design Education at InVision, shares the outcome of a 2200-company research intended to find out how orgs mastered design. What are PWA and what should you care? Not familiar with Progressive Web Apps? Then check this out this article by InVision — originally intended for designers, but equally valuable for product professionals. Delivery dynasty. In China, Alibaba and Meituan are duking it out for dominance of the $35B delivery market. Should we copy the competitors? My ex-colleague at Booking.com Kumara Raghavendra shares a useful model to assess whether to follow a “copy” approach when it comes to features or products successful at competitors. What is Amazon? Zack Kanter recounts the simple recursive guiding principles that led Amazon to unfold its one-off story: from a relentless rise to the mounting pressure of the present in which the giant is centrally policing and incentivizing their sellers to perform as much as employees. How the tech giants make their billions? Insightful visual piece showing us the distribution of income at Apple, Amazon, Alphabet, Facebook & Microsoft. 🚀 Like el producto? Forward it to a friend. el producto is a curated selection of Tech&Product happenings within the last few days from a curious and frequently skeptical Product Owner’s perspective. Free forever. Sign-up here. Full-time learner, product stuff, “triathlete” & global traveller. Former product @ Booking.com and @ Just Eat.